Home Asia Singapore WTH Singapore Woman Claims To Have Been Exorcised - Video Shows That She's Really Been Exercising! The accusations made by Amutha Valli Krishnan against Novena Church look to be disproven in court, as the defense presents a shocking video of her 'real' behaviour - The questions have now been raised as to if she been faking her psychiatric symptoms and perhaps she is not really physically frail as she had portrayed herself to be? 51-year-old Amutha Valli Krishnan is suing Novena Church, two priests and six churchgoers for allegedly forcing an exorcism on her in August 2004. 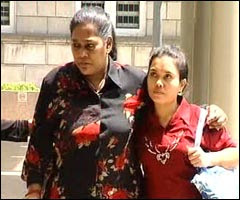 When Amutha appeared in court last year, she looked very weak and wan, and needed help even just to walk. When visiting her psychiatrists after the alleged exorcism, she appeared in the same frail state. However, defence lawyers have shown edited versions of Amutha's behaviour in public. The video footage was filmed by a private investigator, and even showed her working out in a gym on a stepper exercise machine. In other sections of the video, she was seen strolling around, sometimes without the need of a walking stick or any other assistance or apparatus. Unfortunately, that video cannot yet be released to the public, because it has not yet been submitted to the court formally as evidence. Defence lawyer Jimmy Yim, representing one of the priests, asked her former psychiatrist, Dr Ong Thiew Chai, if Amutha was suffering from Post-Traumatic Stress Disorder as genuine sufferers would normally want to forget about the incident which caused the trauma. However, Amutha kept recalling the incident. Senior Counsel Yim also pointed out how she never told Dr Ong, her psychiatrist at Tan Tock Seng Hospital, about her previous psychiatric treatment at the National University Hospital and the Institute of Mental Health. She also did not inform Dr Ong that she made a total of 40 visits to two general practitioners after the alleged exorcism. Mr Yim questioned Dr Ong whether there was deception on her part. Dr Ong agreed that he was deceived, but maintained his initial diagnosis of her Post-Traumatic Stress Disorder illness. Descpicable - suing a church. Tell me what do you know about post traumatic stress syndrome? or are we perceiving people who are mentally-ill as "psychotic" or "abnormal"? Of course, this incident involves a legal case - perhaps as what most might think that she may want to have monetary gain out of it. It is indeed that we should be suspicious of her motives to sue, but we should also not pass too quick a conclusion of her. I think if she claims to be mentally unwell, she should get treated first before proceeding for lawsuit. Case should adjourned rather than continued. I dunno, I have little faith in Singapore judicial system. Maybe we should wait and see how the medical experts testify - if it is not in her favour and the courts rule against her accordingly, I have no problems with this. Problem is, psychology is NOT a science. It is just a bunch of commonalities disguised as truths. The psychologist is most likely conned by the woman. However, admitting it would have put into question his "expertise". It's all quite pathetic really. The woman's story has holes all over the place. Seems like the whole family are a bunch of crooks. True to that, I think there are many factors to consider. I don't think we should just pass it off too easily. Both parties at fault, the church and the woman. BOTH parties at fault ? now thats a new one. Remember that her family asked for help. And why is a non catholic asking for help from a catholic priest in a catholic church ??? Anyways, from the evidence so far, the woman is kooky and so are her family. These folks need to be sentenced to hard labour for rehab. She's a Catholic convert. Novena being allowed to conduct exorcism in this day & age, that should be the question everyone should be asking. Amutha is a classic schitz & even she wasn't why should it be legal for the church to do exorcism? Why are the authorities allowing this? Interestingly, the reports in ST are written by, yes, by churchies as well. It's good to see some logical debate on this. It is always my intention to remain impartial on my own blog site. I would like to point out to all (to keep the discussion going), that the Priests in question have always denied that an actual exorcism took place (they claim that there was a prayer session that occurred at the request of Mdm Amutha's family), and they further claim that the family of Mdm Amutha (particularly her brother) were the only ones that claimed she was possessed by a spirit (that of a dead soldier). The Church members also claim that the family was asked to leave the premises when Mdm Amutha would not desist with vulgarities and abuse (among other actions) of other worshippers (and her family as well). "Novena being allowed to conduct exorcism in this day & age, that should be the question everyone should be asking." My friend, are you new in Singapore ? What are you suggesting ? that the women be sent to IMH for some Electro-convulsive treatment ?? Hmmm...may not be a bad idea. Perhaps her kooky family can be sent there too.